Today kicks off our Technology Services World Conference at the Santa Clara Convention Center. We are expecting over 1,000 attendees–our largest Spring event ever! The theme of the event is “Driving Adoption and Outcomes,” with a big focus on customer success (more on that later in the week), and the shift toward outcome-based services. In my Power Hour presentation, I’ll highlight some of the overarching technology trends impacting service organizations, and reveal the 2015 Technology Heatmap. The Heatmap is a color-coded map of 24 categories of technology used by service organizations, with the colors showing the level of adoption. For example, “cold” categories with less than 25% adoption are blue, while “hot” categories with more than 75% adoption are red. 2015 was the 10th year I’ve conducted the technology survey, which asks about adoption, satisfaction and planned spending for technology. Stay tuned for more details of the findings. Tomorrow, the second day of the conference, I’m spending the entire day in a conference room doing one-on-one meetings. I think there are still a few slots left, so when you pick up your badge at registration, ask about signing up for a 30 minute meeting with me. Happy to discuss any technology projects you are working on, or have on the horizon, as well as topics around multichannel, knowledge management, mobile and social. On Wednesday at 11am, the last day of the event, is another favorite part of the conference for me: the TSIA Vision Awards Competition at Service Revolutions. This is our “American Idol” competition for service technology. Presenters have about 6 minutes to give a demo of their innovative technology or program, and the audience uses live response units to vote on the cool factor of each. We have three categories of presenters: Service Practitioners (TSIA members), Startups (new companies just bringing products to market), and Commercial, i.e., established technology vendors. I get to serve on the judges panel, asking questions and making my usual pithy comments about the presentations. A winner is named in each category based on audience voting, with the winner of the Startup group receiving a $10,000 prize! To all of you attending TSW, welcome to Santa Clara, and thanks for coming! If you aren’t able to attend live, stay tuned for blog posts all week to recap what I’m hearing, top attended sessions, and maybe even a little hallway gossip! This innovative product is an extension of LogMeIn Rescue’s remote control/remote support capabilities, which allow a support technican to “take control” of a piece of customer equipment to diagnose and fix errors. The problem is the agent can only see the screen, not the physical device. Rescue Lens goes a step further. The customer can download the Rescue Lens app on their mobile device, which allows the agent to see through the customer’s camera. Show the customer exactly where that semicolon is on the keyboard. Show them which button to push to reset the system. Walk them through replacing that toner cartridge quickly and easily. Inspect equipment to find that frayed power cord that is the real failing component–though the customer never noticed it. Smart Whiteboarding: Annotate on screen, on any device. This annotation stays in place, even if the device is moving. Adaptive Video Quality: Get the best picture and streaming quality, regardless of the strength of the internet connection. Auto Focus: Easily focus on exactly what needs helps. With a fully burdened field service visit now costing more than $1000, not only will Rescue Lens dramatically cut core support metrics like talk time and resolve time, but it will also eliminate incredibly expensive field service visits. Hope to see you at the webinar, and as always, thanks for reading! I’ve been hearing a new topic bubbling up from TSIA members: creating a customer engagement strategy. Common in the consumer world, B2B companies are putting more emphasis on defining and measuring customer engagement now that more interaction channels are being embraced, and proactive strategies to boost customer adoption and consumption of technology are being developed by more tech companies. A customer engagement strategy includes which channels of support are offered, staffing for all channels to guarantee service levels, tools to deliver multichannel support, and technology to measure and analyze customer satisfaction, loyalty and sentiment. John Ragsdale: Hi Ryan! Thanks for taking the time to talk to me today about customer engagement strategies. Ryan Hollenbeck: Always a pleasure, John, and thanks for discussing this important topic with me. John: I’ve heard B2C companies talking about ‘customer engagement strategies’ for a while, but it is fairly new with B2B companies. Are you hearing this topic bubble up within more of your customer base? I know you have a good mix of B2B and B2C companies as customers. Ryan: Absolutely! In fact, customer engagement is a top consideration for our customers worldwide. Many of our customers are thinking of customer engagement as something that goes beyond managing the experience at touch points to include all the ways companies motivate customers to invest in an ongoing relationship – a lifelong customer journey of sorts! The entire enterprise needs to align with the C-Suite on the vision for engagement: what relationship do you want with your customers? Organizations need to think about different customer journeys and then tailoring experiences along the way by providing relevant context, as well as empowering customers to tailor their own experiences. John: It seems that Verint Systems is uniquely positioned to be a leader in customer engagement. You offer resource management and scheduling tools, case management, multichannel service, knowledge management, as well as a survey platform and voice and text analysis. I can’t think of any other vendors who offer such a “soup to nuts” approach to planning, delivering and measuring customer engagement. Ryan: Verint offers a unique Customer Engagement Optimization platform that enables organizations to enrich interactions, improve processes and optimize the workforce. With the combination of Verint and KANA solutions, “smarter engagement” – where you can capture and manage cross-functional information and behavior around customer interactions and workforce performance across delivery channels – is readily available. Organizations can then inject intelligence to uncover trends and discover why certain employee and customer behavior is occurring. These organizations can then manage interactions seamlessly across channels and use guided business processes and recommended dialogues to deliver fast, precise, personalized service – from next best action, to next best offer. John: I’d like to pose some of the FAQs regarding customer engagement I’ve received to get your input. The first question is “Who owns the strategy?” In consumer firms it seems marketing largely owns engagement strategy, but in the B2B world, service seems more of a driver. Do you see advantages to service or marketing driving this initiative, or should it be a collaborative effort? Ryan: Service is the new marketing! It’s actually a collaborative effort across services, marketing and other enterprise functions. Organizations can analyze customer and employee experience data in real-time to design and implement customer-centric business strategies that unite the organization across people and processes. As a result, they have better alignment across the organization and can move much more quickly to take precise action to deliver differentiated and personalized experiences that count. This improved alignment leads to more engaged employees who are spurred on by solutions that capture and manage information about customers and performance, then use it to predict measurable, sustainable business results. John: Another FAQ is the role of social media in customer engagement. According to my just released 2015 social support survey, less than half of tech firms, 40%, are supporting customers via social media channels such as Facebook and Twitter. But two-thirds of tech firms, 63%, are monitoring social media conversations as part of voice of the customer analysis. Are you seeing best practices emerge around social support? Ryan: Social media is here to stay and we all need to get on board! Social support it’s critical to any organization today. If you don’t have a social media monitoring ad text analytics solution, now is the time. With access to a growing social media warehouse and additional online content, organizations can use Text Analytics to expand its understanding of customers and markets outside of standard feedback channels. These tools provide key insight into what customers are saying about your company—and your competitor’s products and services—no matter where they say it. Text Analytics provides out-of-the-box integration with major social media outlets and business intelligence tools. 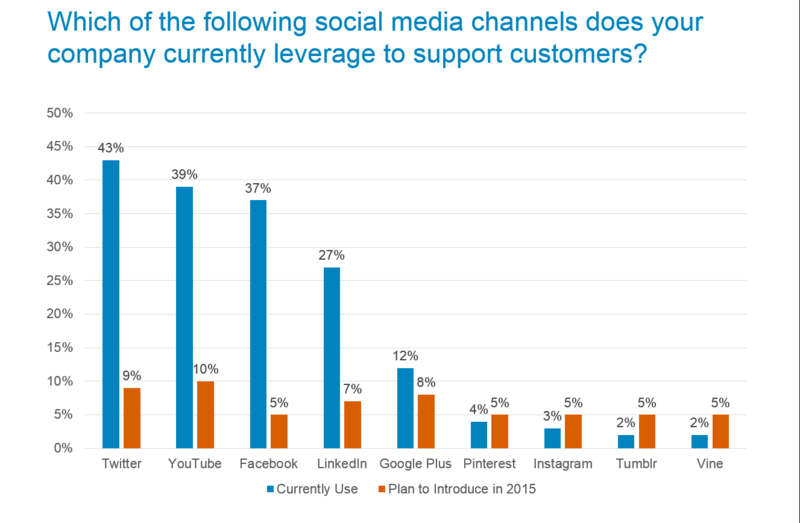 Social media support is here to stay. John: A final FAQ I’d like to ask you about is how to best gather customer feedback. Many companies seem to rely solely on post-interaction surveys and a one or twice a year overall satisfaction survey. In my opinion, this is a good start, but is not nearly enough. Could you talk about some innovative approaches you are seeing to harnessing the voice of the customer? Ryan: We agree that surveys are critical and post-interaction surveys provide valuable insight! And yet there are so many other means to gather the voice of the customer. For example, in addition to highly segmented customer and employee feedback across channels, forward-thinking organizations are also evaluating Social Media to gain deep insight from Twitter, Facebook, and social media monitoring services. They are also looking to analyze Website Visits by extracting information from virtually any website to obtain visibility into visitor experiences and overall site effectiveness. Further, many organizations are seeking to collaborate with Online Communities to construct vibrant, healthy online communities that can synchronize feedback efforts while augmenting customer engagement. Last but not least, let’s not forget the importance of the ability to mine Customer Calls, which can help uncover call drivers, determine customer emotion, identify emerging issues and trends, and measure customer sentiment about products and brand. John: This has been a very enlightening conversation! Thanks for taking the time to chat with me today. Ryan: Thanks, John! We appreciate all of the work that TSIA does to measure and analyze trends in customer engagement models that increase customer consumption and optimize customer lifetime value! Interview with Mark Middlekamp, TSIA VP Research for Expand Selling: Take Our Survey! John Ragsdale: Mark, welcome to my Eye on Service blog! Thanks for taking the time to chat about expand selling and your new survey. Mark Middlekamp: My pleasure. Thanks for having me! John: TSIA has been documenting in our Service 50 and Cloud 20 studies for several years now that product revenues are falling, and service profitability is under pressure, especially for Cloud providers. It’s clear to me that our industry is searching for ways to reinvigorate profitable revenue growth, and I stress “profitable.” There is also the big trend of launching customer success organizations to encourage customers to adopt and consume products, with an emphasis on demonstrating value so you have an opportunity to sell more. Let’s start on the people side. What do you see happening within tech companies related to their efforts to expand revenues within their existing customer base? My experience is that most B2B firms are good at landing the initial sale, but struggle with the revenue expansion piece over the longer haul. Mark: Your observations are correct, John, in that our industry is struggling with how to sell more products and services, and to do so profitably over time, beyond the initial sale. I think many people would be surprised to know that most Cloud providers, who are growing very rapidly, are in fact not profitable. We refer to this emerging area as Expand Selling, and believe it will be at the center of our industry thinking just as we are seeing now with customer success as you just mentioned. As for the people side, we see significant changes occurring in both sales and services related to how their roles are defined, the interactions between functions, and how they work together. The primary driver to all of this is that the cost of sales and marketing in this emerging new world is simply too high. John: I’m guessing that sales processes are critical in creating new expand selling capabilities within the service organization. There are certainly a lot of competing process methodologies for sales, such as Miller Heiman and TAS, but these seem to focus on the initial product sale. What methodologies are out there for expand selling, or are these methodologies still being defined? Mark: You are correct to point out that the processes for the initial sale are quite different than the processes for expand selling. We see expansion revenues from existing customers being generated in smaller increments and over a longer period of time. The frequency of suppliers selling large, upfront and highly profitable products with support services is diminishing. New methodologies and processes are needed. To your question, these methodologies are emerging, and TSIA is deeply invested in identifying emerging trends and best practices in this area. I was brought onboard in September to accelerate our efforts here. John: Let’s touch on the technology infrastructure required for expand selling. I’m familiar with offer management, i.e., tools that can recommend upsell/cross-sell offers to extend to customers as part of a service interaction. But you recently asked me about lead management software, which isn’t something I’ve covered previously as part of service technology. What are some new areas of technology service executives need to better understand as they launch expand selling initiatives? Mark: We see the technology piece as being multi-faceted. One of the key transformation areas we see is in the area of customer analytics. Specifically, how can tech companies use customer data, with their permission and support of course, to better understand how customers are using what they have purchased, and how they can better optimize how they use it to achieve better business performance. As you can see, there is a customer success element to this, which can lead to Expand Selling opportunities. Lead gen is tied to this, since how customers consume what they have purchased can identify new leads. John: You just launched a new survey to gather information about expand selling practices within the tech space. Can you tell us who you are targeting with the survey, and what sort of questions you are asking? John: Glad to hear that the survey is open to everyone, and all respondents will receive a summary of the results. Mark, thanks for taking the time to speak with me today! Mark: Nice to be here! I appreciate you featuring my survey in your blog. This week I published “The State of Social Support: 2015,” which is live on the TSIA website for members. If you aren’t a member of TSIA and you would like a free copy of the report, read on! The report is based on my annual social support survey, which was open December 1, 2014-January 5, 2015. Over 250 responses were received. I will be giving a webinar this Friday, January 30th, to cover the results. The webinar is open to the public, and everyone who attends will receive a copy of the full report via email. The survey and resulting report address two streams of social support: online support communities, and supporting customers via social media channels such as Facebook, Twitter and LinkedIn. For online communities, there are findings about program ownership, staffing, service level agreements, CRM integration, and more. Twitter is the most popular social support channels, followed by YouTube (how-to and trouble shooting videos), and LinkedIn is in third place. Also listed are channels companies plan to invest in this year. Thanks for reading, and hope to see you online Friday!